Wearing only a smirk, I struggled to focus — or, really, not focus — in the dark. I was drifting atop water with 1,000 pounds of Epsom salts in a confined tank — roughly the dimensions of a portable toilet tipped on its side. Did I put enough money in the parking meter? My work email — I have so many unanswered messages. Flotation therapy, a new-age practice associated with hippies and the 1980 horror flick Altered States, has attracted wider attention in recent years as more businesses offer the idea — and curious patrons (including me) test the 93-degree waters in search of escape. With no light, gravity or visual stimuli in the tank, one can do little except zone out. “Your body is learning to shift to a lower level of arousal. It almost starts to ‘reset,’ ” said Tom Fine, an associate professor of psychiatry at the University of Toledo College of Medicine and a 20-year tank researcher who serves on the board of the Floatation Tank Association, which comes up with standards. Pioneered in the 1950s by American neuroscientist John C. Lilly, the vessels — once known as sensory-deprivation tanks — are thought to alleviate a range of mental and physical ailments: depression, migraines, arthritis, muscle tension and more. The weekly floating regimen of Zedrick Clark, a Columbus life coach who last year opened Reflect Float Center in a basement-level Short North space, stopped a lifelong nail-biting habit, he said, and weaned him off supplements to treat attention-deficit hyperactivity disorder. Plenty of floaters, however, just want to unwind. 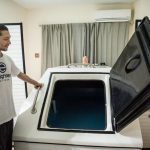 “This can really be a transformative tool,” said the 41-year-old Clark, who offers floats in 60- and 90-minute increments (priced at $75 and $90). As my own hourlong session played out, my cerebral din did indeed diminish. I didn’t experience hallucinations, as some recipients of the therapy report, but I briefly saw swirling colors — akin to the northern lights — overhead. The sounds of my breathing and heartbeat were enhanced as in an isolated outer-space scene from, say, Gravity. I didn’t even hear the staccato beeps of a timer signaling the end of the session; the starting of the water jets brought me back to reality. Later, back at my office cubicle, I felt as if I’d taken a midday nap — a common reaction, I learned. 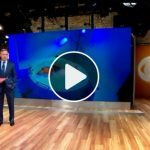 In the tank, a user experiences “a decreased activity of the nervous system, just like you would when you were sleeping,” said Paul Morgan, a University of Pittsburgh research associate who has studied the effects of flotation on injured athletes. Far less prevalent in mainstream society than massages or meditation, the flotation concept has customers asking plenty of questions, said Katie King, manager of True Rest Float Spa in Powell. The first True Rest outpost in central Ohio — the fifth in the Arizona-based franchise — opened on May 10. A second area location, in Columbus, is in the works. The business in Powell features five private rooms, each with a futuristic egg-shaped flotation pod allowing a client to select optional elements of music and mood lighting. An initial one-hour visit costs $59; and a follow-up, $79 (with package discounts available). Gravity Spa, which has operated two tanks for the past three years in the Dayton suburb of Beavercreek, has seen its clientele increase yearly. There and at other locations, floaters are assured they won’t drown (I tried to flip over but ended up with only a stinging eyeful of salt water) and that the tank door can be opened at any time. “You’re in complete control,” manager Noah Mask said. The tank proprietors in central Ohio use ultraviolet light and hydrogen peroxide for sanitation. A shower is required before entering the tank (with bathing suits optional) and recommended afterward to remove the salt. The water, which is filtered between appointments, is naturally sterile because of its high salt content. “They call the Dead Sea ‘dead’ for a reason,” said Clark, of Reflect Float Center. Chris Hawker floats there twice a month. The inventor and entrepreneur, with a child at home and a job that often involves traveling, relies on the chance to recharge. “For me, floating is almost part of a necessary antidote to the hecticness of my schedule,” said Hawker, 40, of the South Side. “I find it actually improves my productivity.